So far I am very pleased with how my "quick and easy" quilt is coming along. All of the blocks are done and they look good placed together. The pink corners form little pink diamonds which I love. There aren't many blocks, so the quilt will be four blocks by three blocks. Once I add a border it will be a little bigger. I'm thinking of using a mint color, do you think that will look good? For the bigger quilt I am working on sewing the six pieces of identical triangles together, three on one side and three on the other. It is going to take me a longgggg time to do. 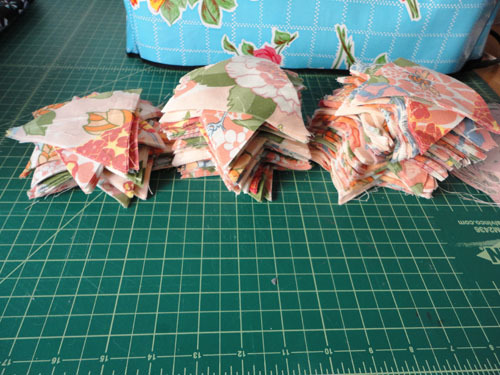 Originally after cutting I had three identical stacks of fabric. Do you see how much progress I have made? :( I have literally worked for hours and have little to show for it. It takes forever making the half hexagons because I have to press everything I sew. I moved the iron next to my machine to make things easier, but this quilt is going to take a very long time to complete. I know what I will be doing this weekend. They are both looking SO good! That is a seriously neat stack of quilting pieces. And i like the floral one at the top! 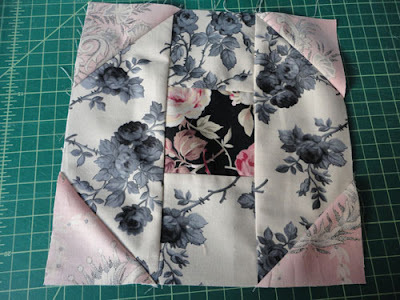 Quilting really is a lot harder than it looks! I have to stay organized or the project will be a pain! This looks lovely! I think mint is a perfect choice for the border! 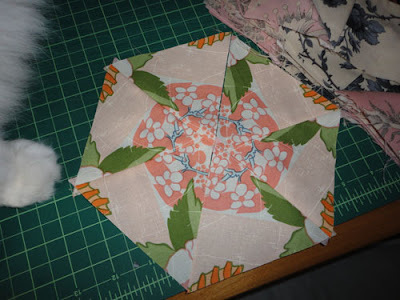 Quilting is way too scary for me-- my mom is a bigtime quilter (a HAND quilter... dude, she's CRAZY) and I can't get over how time-consuming it is! Luckily, since my mom is a quilter, I have FOUR amazing quilts (and literally no ambition to make one myself)! Keep going! This is going to be great! Hand quilting is so intense, I have so much respect for those that do it! Thanks, Sarah. It's going to be a while before the second one will be finished. Hopefully it will be worth the wait! Love those colors!! I've been meaning to start a quilt. ...for like a million years now. I just want to make a super simple large patch duvet cover, but it hasn't happened yet. One of these days! Let me know if you have any basic quilting questions and I will try to help.